The media is unfair to the military, according to the Chief of Defence Staff. During a speech to the Greater Vancouver Board of Trade last week General Jonathan Vance slammed “very toxic narratives” in reporting on the Canadian Forces. Reporting the truth is toxic? With the largest PR machine in the country, the CF aggressively always protects its image and promotes its worldview. 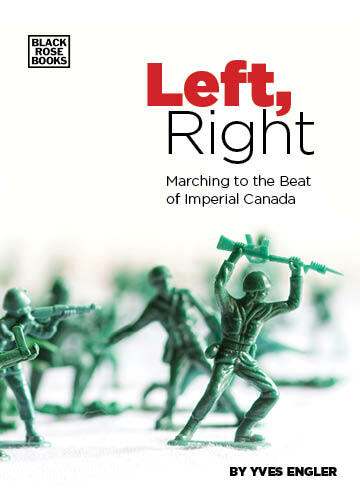 As I detail in my latest book A Propaganda System: How Canada’s Government, Corporations, Media and Academia Sell War and Exploitation, the military runs a slew of journalistic, academic and cultural initiatives. The military produces dozens of publications and its numerous websites make articles, speeches, reports and other types of information easily accessible to the public. The Canadian Forces also employs YouTube, Facebook, Twitter and other social media platforms to promote its positions and recruit new members. In 2010-11 the Canadian Forces admitted to spending $354 million on public relations and related military commemorations. Six hundred and sixty-one staff members worked on this effort. According to another 2011 report, the Department of National Defence’s Public Affairs department had 286 staff. Public Affairs Officers’ write press releases, organize press conferences, monitor the news, brief journalists, befriend reporters and editors, or perform various other media-related activities. A large proportion of the news stories about the military are based on CF statements and events. But that clearly isn’t good enough for the Chief of Defence Staff. After taking charge of the CF, Vance immediately sought to reinforce their influence over news coverage of military affairs. In fall 2015, Ottawa Citizen military reporter David Pugliese revealed Canada’s top soldier’’ call for the “weaponization of public affairs.” Vance proposed a plan to induce positive coverage and deter critical reporting. Journalists producing unflattering stories about the military were to be the target of phone calls to their boss, letters to the editor and other “flack” designed to undercut their credibility in the eyes of readers and their employers. According to Taylor, NIS was employed on at least four occasions to investigate the source of information for stories. Yet in none of these instances was classified material reported. The military is sensitive about embarrassing leaks. A July 2014 Embassy story titled “DND points to ‘challenges’ with former soldiers talking to media” reported on ministerial briefing notes concerning the problem of “leaks.” A year earlier the CF required soldiers wounded in Afghanistan to sign a form saying they wouldn’t criticize senior officers on Facebook or other social media. Former soldiers are a concern since active CF members are restricted in what they can say publicly or post online. An extremely centralized organization, the people at the top of Canadian Forces want to control everyone and everything. To paraphrase a widely circulated quote: when you’re accustomed to shaping coverage, a bit of criticism can feel like a “toxic” media environment. Few Canadians are familiar with pre-colonial African cities, and even fewer know a Canadian military leader helped sack one of West Africa’s great metropolises. In the fifth installment of its Story of Cities series, the Guardian recently focused on Benin City, the lost capital of an important precolonial state. At its height in the “Middle Ages,” Benin City and 500 interconnected settlements were the site of the largest earthworks carried out prior to the mechanical era. The walls built in what is now southern Nigeria were “four times longer than the Great Wall of China” — 16,000 km in all. Dating to the 11th century, Benin City faced growing pressure from European encroachment and the transatlantic slave trade. Finally, in 1897 a well-armed British force of 1,200 sacked the city, stealing or destroying its wealth. Today one is more likely to find remnants of the Benin City in the British Museum in London than in Nigeria. During the Benin Expedition of 1897 Captain Heneker guarded an imprisoned chief, Oba. Not long thereafter Heneker helped capture Oba’s son. The invasions of Benin gave the British access to valuable commodities. Author William Geary remarks that “the results of the operations opened up 3000 or more square miles rich in rubber forests and other African produce.” After the expedition British capitalists intensified efforts to exploit the area’s rubber forests and the Royal Niger Company expanded deeper into Benin. At least a dozen Canadians were among the white officer corps who led a force of some 2,000 soldiers and 2,000 porters to open a 193 km wide and 144 km long area of today’s Eastern Nigeria to British directed commerce. Early planning for the Anglo-Aro War was actually initiated by the Royal Niger Company, which wanted a bigger piece of the area’s trade. Heneker was the senior Canadian during the Aro campaign. Second in authority to Montanaro, the RMC grad led one of the four columns dispatched in November 1901 towards Arochukwu, the capital of the Aro families. His force consisted of 19 European officers and 700 local rank and file. Unsettling words from a Canadian who helped destroy one of Africa’s great precolonial cities. And part of our history.